Late (as usual) and just time to quickly dust off the old girl before heading out to a local Japanese car meet in town, looking forward to standing around hands in pockets, grunting and struggling to digest a Mc Donald's, rashly purchased because I thought I was starving, but after a bite finding I was less enthusiastic.. I'm rambling am I not? So yes! Ms Skyline had sprung a leak of the petrol kind and the fuel hose clip had decided to jolly well and truly 'let go'. Never fear, these problems are sent to try the average Skyline owner, not defeat them! After a bit of racing around the garage (I wish I would look in the last place first), the offending hose was replaced with some new (tighter fitting) braided hose and I could now continue with my planned dust off of her lady ship. However something struck me as odd, most odd, like there was something missing from my life.. Wah! The number plate, complete with carbon fibre surround was absent, missing, gone..
My thoughts immediately returned to the summers evening, when as I was howling up a rather fast stretch of road, there was the bang and clatter of something bouncing along the underside of the car. At the time as I appeared to still possess four wheels and much power, I assumed it was a wayward screwdriver that had made its bid for freedom from the engine under tray. Now I feel more confident that this was Ms Skylines rejection of being known by a number and her bid to be a free woman, girl, car, thing (ahem, probably taking the analogy too far now). So that evening I hunted out my smaller sized plate once more, securing it in place with some handy sticky tape. What to do? Did I really want to spend yet another day making a surround from out of carbon Fibre? Hell no, not really! But it certainly needs something on the front to make a feature out of the number plate. Especially as I wanted to keep it 100% legal. So I cast around, looking overseas and at home. Eventually I came across some old unwanted stock for a USA sized plate holder for of all things.. A PT Cruiser. Whilst not perfect to fit out of the packet as the bracket plate was shaped for the nose of a Cruiser, I thought it had some potential. So after setting about the plastic with a hack saw blade I soon had the thing fitting in the recess well enough. 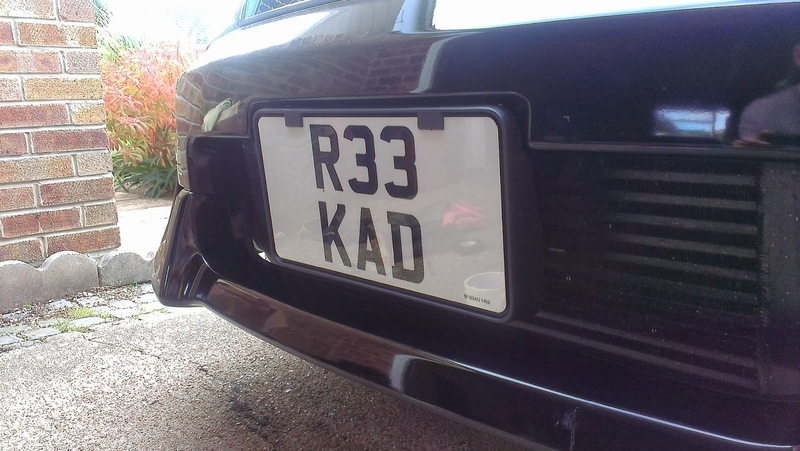 So that I could use the bracket properly I made up a mount (from an old number plate ironically) screwing it firmly to the car, then attached the new bracket and finally the number plate. Oh my I do sincerely hope that this is the last adventure in number plate making I do! It should be as this one is securely bolted together and I think the bumper would fall off before the plate! Made from the highest quality plastic!